*Clickety-clack-type-type* Done! Isn't it the greatest feeling when you've finished writing your book/blog post/autograph on a fan's t-shirt? All that hard work is behind you and now you can bask in the... Oh wait. Now you have to edit. The editing process is different for everyone. It depends on your personal style, how thorough you were on your first draft, and how much persistence you have to read your work YET AGAIN. Ideally, for important pieces of work (i.e. an article or guest post), you'll have at least one other pair of eyeballs on it. For a published book, you'll want a few sets of eyes on it, preferably at least one professional. But before you get to that point, take it as far as you can yourself. That ensures that your work remains as close as possible to your tone and style, and, particularly in the cases where you're not paying someone else to review your work (unless hugs or beer count), you minimize the effort they have to put into it. I aim to write 3-5 pages per day, then re-read it every 20-30 pages. It's hard to switch back and forth between writing and editing so I don't like to do it too often, but I don't want to get too far away from what I've written before re-reading it. 2. Fill in gaps and fix errors. For example, in one chapter of Confessions of a Paris Potty Trainer, I recount a doctor's appointment and by the end of the chapter, my husband is there with me, spouting out dialogue. But when I re-read it, I realized I hadn't specified that he'd gone to the appointment with me. Since my book is a memoir, he was right there in my memory so I didn't even notice that he wasn't there on the pages. 3. Check that I have the right level of description. In two of my books, I write about my life in Paris. Since I've been living here for 9 years, I can picture scenes and locations perfectly. But for my mainly American readers, they may not know what a Préfecture is or have a visual of a typical Parisian street. Sometimes just adding one sentence - "The wide tree-lined boulevard in front of my house was great for long walks, as long as you avoided the dog poop." - paints a picture of my neighborhood. 4. See if I can turn any narrative into dialogue. In my first draft, I just want to get my ideas out and since I'm writing about my own life, it ends up taking on a narrative tone. But converting some narrative to dialogue helps break up long sections and is easier for the reader to digest. It also allows my characters to be funny or slip in some description without my character going on and on herself. I ran into Chris and Dave, fellow expats, at the ball and we chatted over champagne. It was crazy just how small the world was! I turned to see Chris and her husband, Dave. "Well, hello there! Fancy meeting you here," I said, kissing each of them on the cheek. "We've actually run into a few other people as well. Reminds me just how small the English-speaking world in Paris is," Chris said. "And how much we all like to drink!" Dave added. We all laughed. "Well, we'll let you youngsters get on with it," Chris said. "Maybe we'll run into you later?" The second version is more fun to read, provides a little characterization of Chris and Dave (they're married, they're older than me, they like to drink), and moves the scene along. The easiest way to see if you need to convert narrative to dialogue is if you're talking about talking. Instead of "the doctor gave me the worst news possible" have the doctor actually SAY the bad news to you and show your reaction. "If he could just hurry up, we wouldn't be late." "If he would hurry up, we wouldn't be late." See? It reads just fine without "just." "I think it has to do with the French administration's desire to deforest the planet." "Clearly, the French administration's sole goal is to deforest the planet." It's your book! We know you think/feel it! "After the doors to the Préfecture open, you get in line and take your dossier out, naively thinking your turn is coming up soon." "After the doors to the Préfecture open, you jump in line, whipping your dossier out of your bag with an enthusiasm that is totally uncalled for - your turn is hours from now." Replace boring verbs with more descriptive ones that show movement or feelings. "I tried to decide which pastry to order, but there were too many choices." "Ogling the display case in the boulangerie, I was unable to make a decision." In the wise words of Yoda, "There is no try, only do." "The immigration video was very boring and it was all I could do to stay awake." "The immigration video was soul-crushingly dull, making it near impossible to stay awake." "So avoid using the word 'very' because it's lazy. A man is not very tired, he is exhausted. Don't use very sad, use morose. Language was invented for one reason, boys - to woo women - and, in that endeavor, laziness will not do. It also won't do in your essays." I won't bore you with all 40+ words on my checklist but you get the idea. In looking at my examples, you can see that by running my list I'm not just replacing "get" with "jump" - I'm forcing myself to look at the whole sentence in a new light and see which additional changes could spice it up. In many cases, my edits actually make my sentences longer and that's fine. 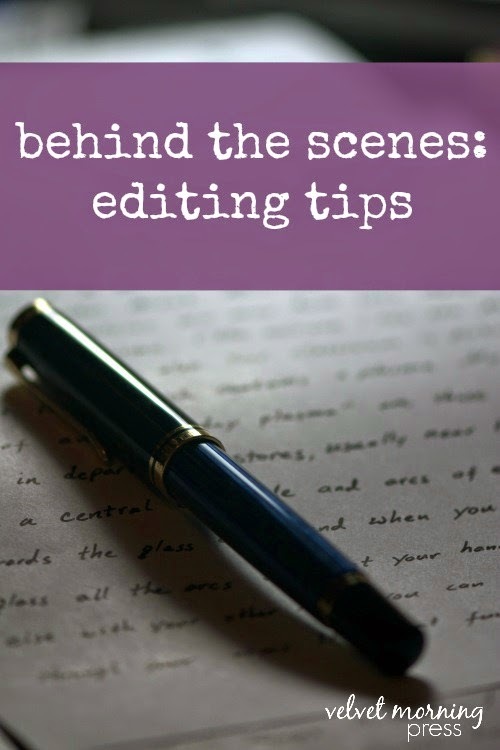 Editing isn't just about cutting things out, it's about improving your content to convey your thoughts in the best way possible. That may mean shortening, lengthening, describing more, or adding some "punch." 1. Sentence. I scrutinize each sentence and see if there's a better way to say what I'm trying to say and if there's anything I can remove. 2. Paragraph. How does each sentence fit in the paragraph? Does it flow? Should I break out the paragraph? Is one sentence really just a repetition of another? Cut it out! No need to show off your writing skills by saying the same thing two different ways - show off your editing skills by deleting one of them. 3. Section. Does the section start and end on the right tone? Does it convey everything it needs to and nothing more? 4. Chapter. How does the chapter flow? Is it clear why each section is included? Anything to add/cut/move? Every word/sentence/paragraph/section/chapter needs to contribute to the overall story. Does it match the theme? Could it be said better? If you remove it, do you miss it? Readers don't always notice tight writing but they definitely notice when it's not done right. This is the hardest for me because I've already read the dang thing so many times. The goal is to read beginning to end as quickly as possible and as an actual reader would. It's best if you have an ereader so you don't have to print it out again, and it's really hard to do this sitting in front of your computer. As you're reading, you're looking for overall readability and continuity. Does one chapter stick out to you as boring? Unnecessary? Repetitive? Do you have a bunch of action-packed chapters in a row and then a few that aren't as exciting? Should you change the order? Make the dull ones more interesting? Spread out the content? Only you know the answer, but you won't even know the problem until you can look at the book as a whole. Try to read your book in a 2-5 day timespan so that you really get the overall feel. If you're a slow reader like me, that will be hard. But you can do it!